No visit to Craig y Nos should be made without calling in on the Welsh Show Caves. People travel from all over the UK to visit these Caves. There are many miles of natural limestone caverns under the mountains on both sides of the valley at Craig-y-Nos. 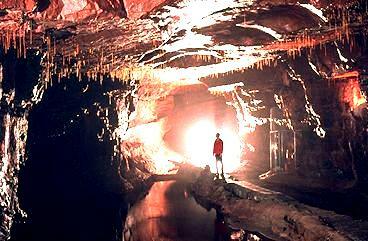 The National Showcave Centre for Wales is only half a mile to the north of Craig-y-Nos Castle. This complex enables visitors to enter and view three very different cave systems. It also features a Dinosaur Park, Geological Exhibits and an Iron-Age Village. For more information see the link here for our own brief description and visit the main showcaves website here.